Noble, electric grill, entirely made of stainless steel - for energy-saving, low-fat cooking for indoors and outdoors. The Teppan Yaki provides a year-round barbecue pleasure. 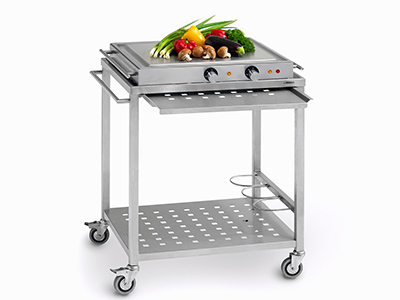 The serving trolley, also entirely made of stainless steel, is the optimal accessory for the Teppan Yaki. The mobile servant is stable on its 4 rolls and can also be used as a solitaire.